The tuxedo cat exists dependently upon endless causes and conditions: water, Friskies, sunlight, atoms, oxygen, etc. The tuxedo cat exists dependently upon the sum of his little kitty parts: ears, black and white fur, tail, four legs, paws, claws, etc. The tuxedo cat exists dependently upon a the label "tuxedo cat" projected by the mind onto its base. Is the tuxedo cat aware of all of this, or is he in a complete moggy-fog? He cares only for wet food. Ah let's hear it for embellished reality (imagination - maybe where the gods come from). The cat is seen, felt, heard and cognized. Its existence is a dependent arising. 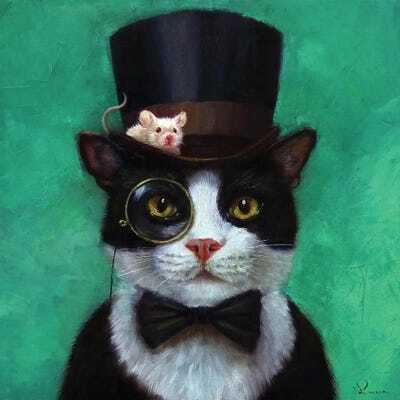 We see a hat, a monocle and a bow tie. Also the eyes, nose, whiskers and the human parody. The cat only sees the mouse. "Dependent on the intellect & ideas there arises consciousness at the intellect. The meeting of the three is contact. "'Everything exists': That is one extreme . 'Everything doesn't exist': That is a second extreme. Avoiding these two extremes, the Tathagata teaches the Dhamma via the middle: From ignorance as a requisite condition come fabrications. From fabrications as a requisite condition comes consciousness. From consciousness as a requisite condition comes name-&-form. From name-&-form as a requisite condition come the six sense media. From the six sense media as a requisite condition comes contact. From contact as a requisite condition comes feeling. From feeling as a requisite condition comes craving. From craving as a requisite condition comes clinging/sustenance. From clinging/sustenance as a requisite condition comes becoming. From becoming as a requisite condition comes birth. From birth as a requisite condition, then aging & death, sorrow, lamentation, pain, distress, & despair come into play. Such is the origination of this entire mass of stress & suffering. I especially liked and enjoyed the second 'box', @pegembara.